So, you're putting together a bid for a customer on a series of new windows. Once you calculate the cost of materials and labor and it adds up to $8,000 before you calculate profit (we are keeping with easy round numbers for this example.) You want your profit margin to be 20% on this job. Too many contractors short themselves on their bids and do not even realize it. Using a mutation of what they believe is the cost plus method (this is not the actual cost plus method, as that is a way of calculating labor expense), they take the overall job cost and add a percentage of that for-profit say 20% in this case. You want 20% of the overall bid to be profit in your pocket right? Well at this rate you have just SHORTED YOURSELF $400.00 on a $10,000 job. That’s a new power tool at a minimum and could even have been a new deer rifle in your gun safe. So how are you supposed to calculate 20% of your bid as profit? It’s so simple your gonna laugh, to keep yourself from tearing up. You have taken the job cost, $8,000 and made this 80% of your total bid by dividing the job cost by.8. By dividing your total job cost by .8, you have just made that $8,000 into 80% of your total bid, and you are left with a profit margin that is 20% of your total bid. PFM? (PURE FRIGGEN MAGIC), Nah, just math! "It's not that big of a deal,” you say…. Well, let’s try it on a little bigger project. Let's say you are bidding a whole house. Total cost with labor included is $258,000. Your old method 258,000 x 1.2 = $309,600 gives you 51,600 in total profit (if all goes well). Now let's try it using the correct math. 258,000 / .8 = $322,500 giving you $64,500.00 in profit. Thats $12,900 more than your old method. So if you want a 25% profit margin, just divide by .75. Or, maybe you're looking to be a really nice guy and only take a 15% profit margin, then divide by .85. Whatever you want your profit margin to be, just take 1, minus the margin .2 for 20%.18 for 18% and so on. And what you are left with is the divisor. Be it .8 for 20% or .82 for 18%. 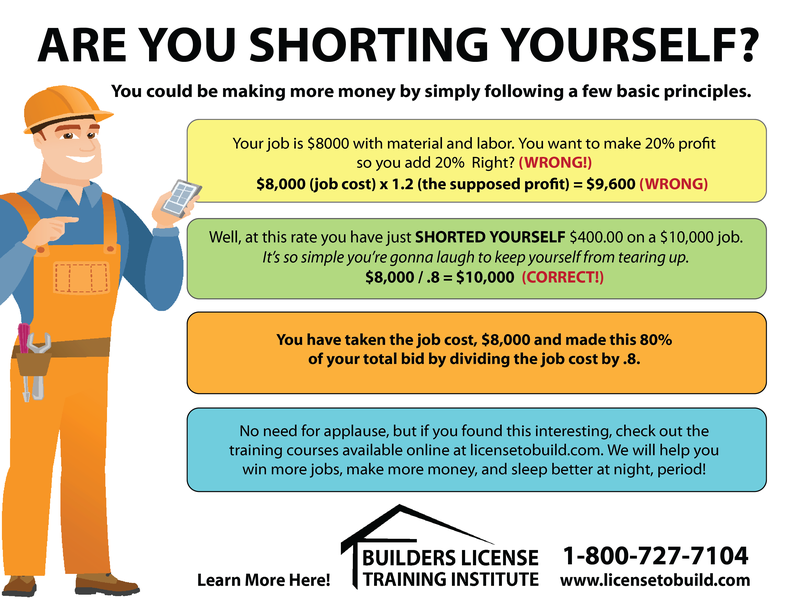 No need for applause, but if you found this interesting, check out the training courses that are available online at licensetobuild.com. We will help you win more jobs, make more money, and sleep better at night, period. This entry was posted in Construction and tagged Construction Math.